Ex-ATSF; #560-582 returned to lessor; remaining B40-8W's in the 500-559 block are undergoing rebuild and repaint at GE. Note: Several "600-class" AC44C4M series locos have been reblt to AC traction with A1A trucks, including 599-619. Many SD60M's received a rebuld at Progress (Mayfield KY) from late 20172 & 12/2018: 1400-15, 1419, 1422-38, 1445, 1448-49, 1451-52, 1459-60, 1468,& 1470. 7/56, ?? Ex-BN < nee NP 283 & ?? Nee ATSF 3824-3839; loco 3190 is off roster. Nee ATSF 3840-3846; loco 3190 is off roster. 9-10/05 #5815 is a dual fuel loco, and is sub-lettered "Next"
#9600 retired along wth many other units being stored /retired: 9620, 9654, 9685, 9694, are stored. ** Note: #9647 ("Vomit Bonnet") was rebuilt and repainted into the latest BNSF attire. ** 22 of the 9700s have been converted by Progress Rail to SD70MACes: 9714, 16-18, 21, 25, 28-30, 34-36, 38, 46, 48-50, 52, 53, 67, 71 and 72. 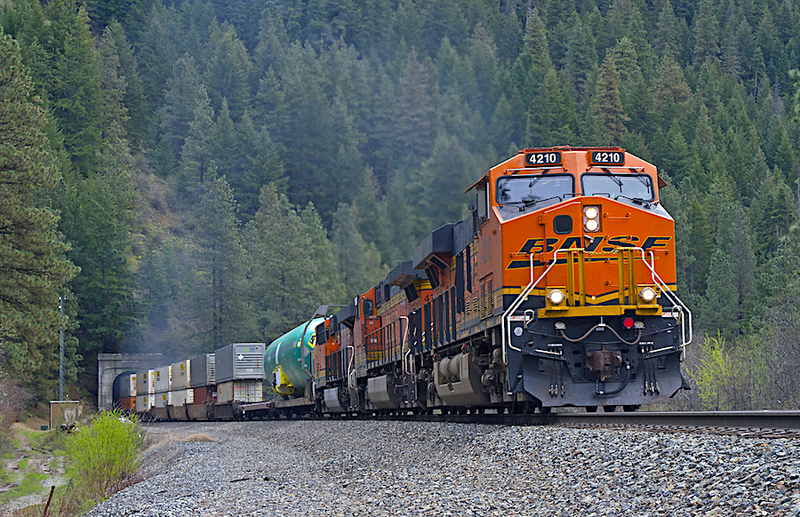 Craig Walker has prepared a comprehensive listing ( 2014) of all BNSF units that wear the New Image. Additions and revisions would be appreciated. SD70ACe serial numbers and builder dates are current as 12/2014 thanks to data from Ralph Back via LocoNotes. ** Per Sean Graham-White, 2015 deliveries may be classified as straight ES44C4s or ES44C4-T4CUs (Tier 4 Credit Units). Ex-ATSF units #800-852 (even #s only) were sold to Canadian National as 2135-2161. BNSF 100 and 130 may have received some type of Tier 3 emissions kit. The locos are to undergo a three-month break-in period in Transcon service before going to Topeka for additional testing. It is unknown whether the performance enhancing modifications necessitated revisions to the prime mover or installation of new exhaust scrubbing equipment. Several 1600, 1700, 1900 and 6300 series locomotive have been assigned a GN (Great Northern) number and stored. Please refer to TABLE G.
Units with a 2nd ATSF # in the 7200-7229 number series were painted in the red/yellow SPSF "Kodachrome" scheme. BNSF 1576 upward were assigned the GN reporting mark to the 1st BNSF # before rebuilt. BNSF 1576 upward that have a 1st ATSF # from the ATSF SD45-2 5625-5661 number series have the small front drop step replaced with a wider/stronger front anti-climber. This section was updated and expanded by Ralph Back (based on data from LocoNotes). Rebuilt Power - BNSF got a few rebuilds during November that were GP39-3Rs rebuilt from ex ATSF GP35s. On November 10th, 2628 was released from Relco in Albia, IA. The 2628 started off life as ATSF 1431 that was renumbered to 3431 in the 1969 & 1970 general renumbering. It was rebuilt in kind to the 2931 in the early 80s then was re-numbered to the 2631 for the BNSF merger. It was later re-lettered as GN 2631 before it became the new BNSF 2628. On November 3rd, BNSF got the 2 629 from Relco. It was originally the TP&W 902 that became ATSF 3464 when ATSF merged the TP&W into its system in 1983. It was shortly rebuilt in kind (with dynamic brakes added) in 1984 to ATSF 2963. It carried that number until re-numbered to BNSF 2645 for the BNSF merger and was lter re-numbered to GN 2645 before being rebuilt to the 2629. This was one of the last GP35s in service on BNSF before it was pulled to be re-built. It appears that there are three other GP35s still in service; they are the 2515, 2572 and 2626. BNSF got one more 3GS21C-DE from NRE during November -- the 1311 that is rebuilt from a former Santa Fe SD45-2. The BNSF computer shows this engine rebuilt from former BNSF 6507, but that core was actually used for the 1315. Lease Units - BNSF continues to lease units from CP. There are actually 4 more on lease this month. Four more AC4400CWs (9506, 9511, 9543 and 9550) are now on lease, making a total of 63 CP engines. The lease fleet still includes the CREX ES44ACs, the CEFX SD40-2s and SD60, the NREX SD60s, and several PRLX GP38-2, GP40-2 and SD60Ms. In addition to the CP engines that were returned off lease in October, BNSF returned a few more off lease in the form of the CEFX SD90MACs. At the end of October and early November, all 6 of the SD90MACs were returned to Northtown for CEFX and lease termination. They were numbered 105, 125, 130, 133, 136 & 137. Michael Richmond has provided major updates to serial numbers and builder dates throughout the BNSF roster. Table Z data was prepared by Marlin Thorman. Our thanks goes out to both of them. Sean Graham-White's on-going reporting (via LocoNotes) of new locomotive orders is greatly appreciated. Michael Richmond, Leo Ames, Scott Arentzen, Peter Arnold, Simon Awcock, Martin Baumann, Joseph Belote, Roger Beckett, Richard Bisch, Cordell Booke, Zack Bovitz, Tom Boyer, Tom Boylan, Wes Brantley, Jeff Carlson, Derek Carter, David Collins, Tony Combs, Godfrey Crane, Ted Curphey, Shane Darst, Dennis DeBruler, Dale Devene, Carole Dorney, David Everard, Robert Del Grosso via LocoNotes), Daniel Fredricksons, Charles Freericks, Robert Forsstrom, Tristan Garrett, Dave Gentry, Jacob Getzelman, Lee Goettig, Bill Gillfillan, Mark Gillings, Alan Grey, Charles Grubb, Chris Guss, Billy Hager, Roman Hawryluk, Billy Hunter, Matt Hagfors, Mike Harbour, Mike Hoppe, Billy Hunter, John Gabriel Ibay, Rupprecht Gersdorff, Norm Ishler, Bryan Jones, Steve Kessler, Ron Kohlin, John Komanesky, Steven Lave, Joe LeMay, Doug Luke,Curt McCullough, Hoss Maslouski, Jeff McLeod, Frank Mellot, Jeff Miller, John Morear, Mike Murray, Dave Nickson, Eu-Jin Ooi, Joe O'Connell, Rob ONeill, Martin Oksnevad, Dennis Parejko, Matt Petersen, John Poshepny,Jack Prange II, J. Henry Priebe, Jr; Jacob Rajlich; Michael Rapchak, John Regan, Jim Rasmussem, Steve Reeves, Michael Richmond David Richerby, Matthew Ryan, Kevin Sadowski, Mark Schofield, Larry Schwartz, Mark Scott, Eric Shock, Ewan Thomas Shortess, Dustin Smith, Scott Snell, Russ Strodtz, Paul Sullivan, Steve Thomas, Gary Stuebben, Marlin Thorman, Jim Tiroch, Jerry Voss, Craig Walker, Ed Weisensel, Jim Wendelin, Evan Werkma, Larry Schwartz, Tim West, Paul Wester (via LocoNotes), Fred White, Bob Young and Lance Zimmerman. Reference Sources: BNSF 2018-2019 Locomotive Directory by Paul K. Withers; BNSF Railway Locomotive Directory 2017-2018 Paul Wester and Paul K Withers; Burlington Northern & Santa Fe 1996 Motive Power Annual by Bill Shippen, Burlington Northern Annuals (1971 & 1972), Burlington Northern Santa Fe Annual (1997), Diesel Era Magazine, Extra 2200 South Newsletter, LocoNotes (internet), Eastern Rail News (Kevin Burkholder), RR Picture Archives.Net, LocoNotes II (Ken Ardinger), EMD Order Numbers on TrainWeb.com, and Trains Magazine.